Last October I had the opportunity to lead a full-day Presentation Magic workshop for my psychology peers at my professional society’s annual conference in Darwin. I had submitted it as a proposal for several consecutive years, and finally someone decided to take a chance on both the subject matter and me. I have presented workshops for the conference in the past (but not presentation skills), as well as local workshops for state sections. The workshop attracted a diversity of academic and professional psychologists. I knew this beforehand because I asked the conference science committee to send me the class list. Fortunately, I was sent an Excel spreadsheet which included attendees names and their institute, including if they were in independent solo practice. There are several things you could do with this data set which numbered 25 attendees, the top limit I had imposed. So let me go through some of the assumptions and actions that follow which I made in preparing for this challenging workshop. I say challenging because most attendees at Presentation Magic workshops aren’t up on the psychological aspects I bring to them, while I expect psychologists will… which means some of the element of surprise and delight may be underwhelming to this audience. Add to this dimension that I’m likely to know some of the attendees personally, and likely to bump into them again at future functions. No “hit and run” possibilities if you do a poor job! So where to start in preparing? Well, I have a syllabus from previous Presentation Magic workshops and seminars, delivered to a variety of audiences, and continually tweaked via a feedback loop each time I present. The question is one of focus, emphasis and de-emphasis, second-guessing what the audience will want to experience given the write-up that attracted them in the first place. My other preparation starting point was an assumption that psychologists’ presentations would be the usual Powerpoint stuff, even if they had bought a new Mac and were using Keynote. This is the voice of experience in your head, having been to my fair share of psychologists presenting. So I felt safe that my information and presentation style would engage the audience. The task was to refine the focus for this particular group. I started by Googling the names of all the attendees, placing their names in Safari’s Google search window, but adding .ppt. This allowed me to quickly locate any presentations attendees had offered in the public domain. The chances of a private practitioner being located this way are small, while it increases for academic psychologists. I located a few presentations by professors who were attending, as well as recent post-docs who had been doing the rounds of local conferences displaying their work. What did turn up was interesting once I removed the ppt keyword and just searched on names: a mix of results that told me that some of my attendees were actually presenting at the same conference after my workshop; and the nature of the work they were performing in their employment. The first part – that some were presenting – gave sense of immediacy to my upcoming workshop. Would it be possible to offer guidance some of the audience could use immediately, or would they lose confidence because their presentation slides contained many faults I was going to highlight (the usual suspects: too many words per slide, lousy clip art, poor colour choice, overused backgrounds, cliched animations, etc)? But one must bear in mind another assumption that follows: that those people already up for a presentation and are willing to take time from the conference to attend a presentation workshop are sufficiently insightful to know they need assistance, that there is a better way – but what? So, rather than being concerned about the situation, I decided to take advantage of it. My thought was to side with them and offer that most people present the same way, and it’s not their fault. If the cognitive style of Powerpoint is what powers most presentations, it takes a lot of confidence to go against the grain. This reinforced my desire to discuss early in the day the concept of “social conformity”, familiar to my audience, and how it can even impact on how psychologists present. I made the assumption that something they learnt about in Psychology 203 but applied directly to them so much later in their professional lives, and in ways they hadn’t thought of, would surprise and delight them. It would also offer me up as someone who “knew his stuff “as a professional psychologist and add to my authority status. If they could experience surprise and delight on several occasions throughout the workshop, then perhaps they would appreciate its importance when it came to constructing their own presentations, even if the subject did not immediately lend itself to these concepts. But “surprise and delight” is what I want audience members to experience, because I assume it assists the likelihood my messages will be remembered, and my workshop too will be remembered as one to tell colleagues about, and score well in evaluations. By looking at who was attending and where they worked, I made further assumptions. I began to make assumptions as to who my audience’s audiences were! In other words, to whom would they apply what they had learnt from me? Would it be inhouse training, presenting to politicians, pitching for tenders, training juniors, working directly with patients and clients, lecturing to students, developing e-learning tools, etc. Of course, if you’re commissioned to develop a workshop you will spend considerable time with your contact drilling down on the audience’s composition, and your contact’s hopes for the workshop. (After all, long after you’ve left the scene, his or her work colleagues will remind him or her of what a great or lousy job he or she performed by contracting your services). Consultants develop this skill so as to properly target their audience, again with their intention of delighting them, while they gain an education they can immediately apply. That’s one of my personal mission statements. Probably because so much of my early training in clinical psychology was learning to be part of a therapy team which focussed heavily on the intake process, that training has stayed with me beyond my work as a psychologist. Let me expand a moment, because it also explains why I personally take calls from patients wishing to make a first appointment. It surprises and delights them that they speak directly with me, rather than a secretary or PA. Those who feel it takes away from my professional status are best to seek help elsewhere – it’s a poor match from the get-go. Part of the intake process is not to ask “what’s wrong”, but to work out if the caller’s desires are ones you can satisfy. This may have to do with what they wish to change (the biggest and most important assumption); how they see the change occurring and the role they expect you to play; how long they expect the process will take; what attempts have been made in the past (with or without professional help); who else is involved in their current concern and would it be appropriate for them to attend too; are there legal issues involved (will I sooner or later be asked to give evidence in court); how did they learn about me (being careful not to acknowledge the names of any patients who provided your name to their friends or family members); and of course, who’s paying and when do you expect to start? Some professionals keep an intake checklist they go through to cover all basis, while others prefer a more conversational style which doesn’t sound like they’re ticking boxes and patients are just another number. I believe a good intake interview is worth a couple of face to face sessions, and can save the psychologist and the patient a lot of trouble down the track. I mention all this because those of you who wish to go beyond the mechanics of slide construction no matter your creative tool of choice may also find yourselves in the role of consultant, employing your skills as I do helping others, as well as creating training materials leveraging your presentation skills, e.g., web-based learning, curriculum design, etc. With much larger audiences where all this research is not feasible, I arrive early at the venue, make sure the technology including my own is working (I actually run through as many slides as possible to double-check), then walk around the group saying hello and generally “working the room” before we make a start. The higher up you get in the public speaking sphere, the more presenters want their entry on stage to be a big deal, so getting to know the audience just doesn’t happen. I learnt this going to television shows where a warm-up artist would get the audience in a good mood, let them know their role in the television recording (when to cheer, applaud, be quiet, etc) and then the main host would enter to huge applause. Occasionally, some hosts would come out early and warm up the audience themselves, especially if there was to be audience involvement as part of the show. These first few moments before you start can be critical, literally setting the stage, and giving you a chance to reach out to the audience way before you show your first slide. Don’t ever underestimate its importance in getting you over, and helping settle any apprehensions you may have. In my October session I located a few professors to whom I would direct questions later, a Jungian analyst to whom I would sidle up and openly discuss archetypal stories, and a psychiatrist who was feeling like a fish out of water but had come especially for the workshop, deeming it an important aspect of his professional development. Later in the workshop I was able to utilise his unique (for this audience) knowledge base. Again, knowing what he might know from his psychiatry training added to my authority. Making assumptions always carries risks of being wrong. Good presenters I believe do their audience research, construct their presentations with a knowledge base in mind, then act on that knowledge base ever mindful of how they’re getting their message across. They have stories to tell, ideas to share, and good antennae for knowing how they’re doing. In Ocotober, I decided to throw caution to the wind, not sure if I’d ever be invited back, and try some new ideas for the first time. It wasn’t as risky as you might first think, because I decided to co-opt, then augment some ideas from my mate Garr Reynolds and his mate, Nancy Duarte. Just a few days before I left for Darwin, Nancy had blogged, with video, some time she’d spent with Garr in conversation about scientific presentations. I liked the ideas discussed, and so at some early point in my workshop, having made some assumptions about the audience, I employed their ideas. It was based on the diversity of audience members whom I assumed wanted something a little different because of their audiences. 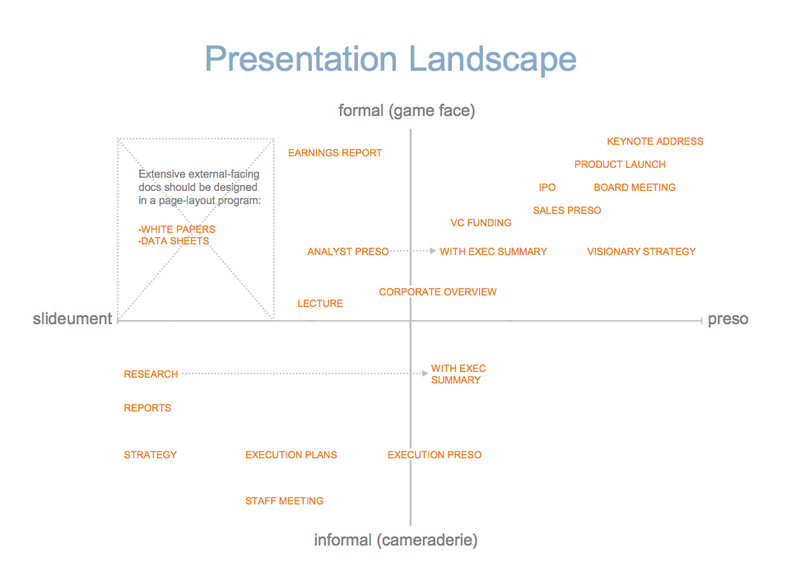 You can consider your presentation as existing on two orthogonal axes. One, the horizontal in Nancy’s landscape diagram represents the structure or sophistication of the presentation. At one end, the presentation in fact is merely a handed-out document of the slides – a slideument to use Garr’s expression – which is merely a Word diagram imported into Powerpoint and made to look like a Powerpoint slide. This might be the pdfs of slides students download before they attend a lecture. There’s room to annotate it as the lecture proceeds. At the other extreme is the full-on presentation delivered with all the whistles and bells modern multimedia can offer up. The vertical axis is a measure of what the presenter brings to the audience, and so also includes audience characteristics. At one extreme is an informal presentation, perhaps to one’s colleagues over a lunchtime meeting; at the other, is one where to use Nancy’s terms, you put on your “Game Face”, where your presentation really counts, where you pull out all your presenter training and gifts. Lots hangs on this presentation. Notice in the Presentation Landscape that the most populous quadrant suggested by Nancy is the one that more combines formal with presentation, which one presumes is where much of Nancy’s experience (and income) resides. The least is the full-on presentation in an informal domain. This is where I spend a lot of my clinical time, showing patients complex information about their disorders and concerns and using Keynote to break down these ideas into manageable chunks, letting the slides tell a story. From time to time, I also use Keynote to illustrate fearful situations or objects especially for those who have a severe phobia, and this forms part of an exposure-based program, a gold standard for phobia treatment. In Darwin, I used this structure as a starting point, and gave my audience a chance to break into small groups of five and describe to their colleagues how this 2 x 2 matrix fitted for them. Now, since these were new ideas about presenting, I wanted to offer the group a way to visualise their task, so I offered up some illustrations of the four elements of the matrix (I didn’t show them the Garr/Nancy video, but preferred to use psychology based examples to aid the learning process). Now the Landscape model is a reasonable one, and easy to teach in a presentation class. But I fear it is missing a third, and extremely important dimension, one that comes from the neuroscience of learning: the dimension of Prior Knowledge. How Garr and Nancy’s Presentation Landscape model is missing this vital piece will be covered in Part 2 of this entry, next.